I’ve spent a fair bit of time in Wollongong (and the broader Illawarra) over the past five years – recreationally and for study. But I’ve never really thought about what a tourist might be looking for. In the last few weeks, I have had to approach the city from that angle because I’m organising a national event in February and this week I was asked to show around some international visitors. The Visit Wollongong tourism website has a whole stack of useful information, but as I browsed its pages I noticed a few things that it could do better. Wollongong is the regional centre of the greater Illawarra region, which for my purposes includes Shellharbour, Kiama, the Southern Highlands and the northern part of the Shoalhaven. Yet, the main pages of the tourism website only seems to highlight features within the Wollongong City Council area. This is undoubtedly because the tourism organisation is largely funded by Wollongong City Council. Nonetheless, there is a missing market for day tripping holidays based in Wollongong with excursions to nearby areas. Tourists to the Illawarra then have the choice not only of the existing promoted activities, but also attractions such as the Illawarra Fly, the Bradman Museum, Kangaroo Valley, the Kiama Blowhole, Jamberoo Action Park, vineyards, dairies and more. This approach could provide tourism benefits to Wollongong and the surrounding areas. These things are listed on the site, but are buried away. 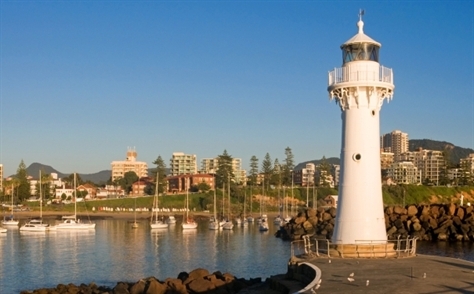 Wollongong has a great waterside cycleway, which is listed on the Visit Wollongong site. However, there is no indication of the availability of bikes for hire either by private commercial operators or by public hire scheme. How can tourists make use of the vaunted bike path without bikes? Lake Illawarra and the ocean are listed on the website, along with the generic suggestions that you can windsurf, waterski, fish and sail. However, there is no obvious indication of just how such activities can be accessed, as with the point above. This needs to be improved if watersports are to be used as a selling point for the city and region. I’m a stickler for grammar and spelling. I often make mistakes myself (on this site and elsewhere) but there is no excuse for poor grammar and spelling on a website with the resources of the Visit Wollongong site. It looks sloppy, and leaves a bad taste with site visitors. There is no search feature on the site. What if someone has heard about a great cafe or hotel or attraction that they simply must visit? Instead of searching, they have to browse through the dozens of site pages. Sure, there is Google, but why isn’t this information easily available on site? These are just some first impressions. I’m sure someone will want to prove one or more of them wrong. That is fine, but I doubt tourists trying to decide where to go when planning a holiday will hang around if any of these things annoy them about the Visit Wollongong site.